Pink Champagne Punch Cocktail is the perfect drink recipe for any occasion. Just three ingredients and it’s pretty enough for a birthday, Christmas, or New Years Eve! Sometimes all that will do is a champagne cocktail. Bonus points if it’s pink! Growing up, every time we had a party or gathering of any sort there was always a worry about if we had enough food. We’d plan and cook and shop and cook some more so everyone would have enough. 12 people? 12 cupcakes in each flavor, what if they wanted to try both? 10 people at Thanksgiving? 5 pies because you never know if people will want seconds or thirds! As an adult, I follow the guidelines my parents taught me, which usually means at the end of a party it looks like no one ate anything because we started with so much. I can’t tell you how many times I’ve eaten party leftovers or re-frozen desserts to use at a later date because I cooked for 15 when I invited 5. I’m not great at gauging out much people will eat, that’s for sure. The same mentality goes when it comes to alcohol. Have you ever seen that meme “Nothing means business like getting a cart at the liquor store”? That is so true! When we are entertaining I go to town, creating cocktail recipes (my pineapple party punch and lemon cupcake martinis make often appearances) and shopping for ingredients and wine and champagne and all the things I think people might want to drink. A few months ago, when I had my 40th birthday party, I hired a bartender. She sent me a shopping list for the alcohol, itemized out with the amount to buy based on what drinks we were serving and how many people were coming. Yep, you can tell what’s coming: I blew that estimate out of the water. She said buy two Costco-sized bottles of vodka; I bought three. She said 6 bottles of wine I bought 6 of EACH kind of wine (red and white). She said a 5 bottles of champagne and I bought 8 bottles of prosecco and 12 bottles of sparkling pink rosé, because I knew my friends loved both. What if they want a glass of each? Or three glasses of each? I didn’t want to run out…that would be rude! Two months later and I have 6 bottles of Sparkling Rosé and 4 bottles of prosecco left. (That doesn’t even count the two, yes two, bottles of sparkling rosé I found in my freezer. One exploded, the other is in tact and I’m just ignoring them and hoping they go away. Basically, the moral of the story is I have some cocktails I need to make this holiday season, if only to use it all up. Forget a cookie exchange, let’s have a wine exchange. I’m not a huge fan of sweet wine so I wasn’t sure how to use the sweet rosé I had leftover, but then I thought of punch. Champagne punch is super easy and festive, and it happened to pair perfectly with the Kate Spade birthday party I was throwing for a friend of mine. Whether you make this punch for a birthday, Christmas, or New Year’s it’s perfect for every celebration. Champagne, especially pink, just screams party and festive, don’t you think? What would have been easier is if you can return alcohol in California but you can’t. So…you guys get to benefit from all the cocktail recipes! 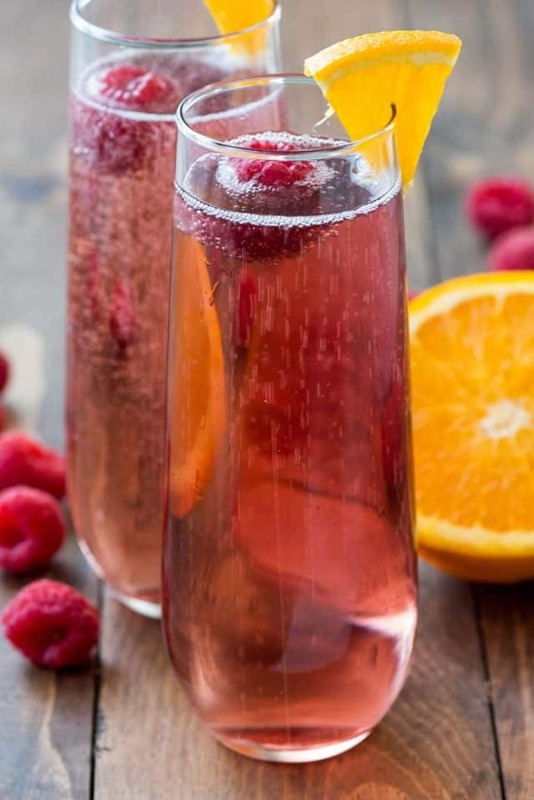 Pink Champagne Punch is the perfect holiday cocktail recipe paired with vodka and orange liqueur. You can make this cocktail one of two ways, and I wrote both in the recipe. Make it for one. 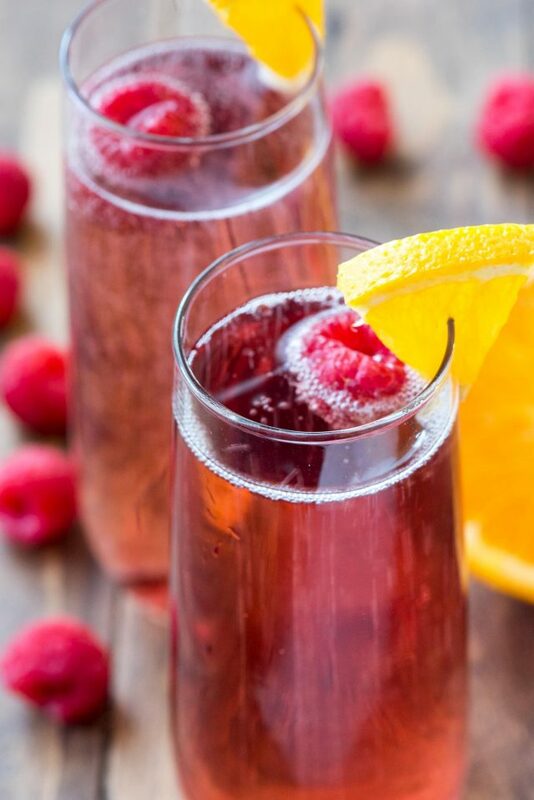 Simply add some vodka and triple sec to a champagne glass, then top off with your favorite sparkling rosé. Make it for a crowd! Use a pitcher or a punch bowl and use the entire bottle of champagne. This is the perfect versatile cocktail punch recipe for any party, I promise. It disappeared fast and I had to make a second pitcher when I made it at the birthday party. I love serving this in a simple pitcher (like I did my Prosecco Punch) but you could also do a punch bowl. Add some orange slices and raspberries to the pitcher or bowl for color. When picking a sparkling rosé, there isn’t really a specific one you have to choose. 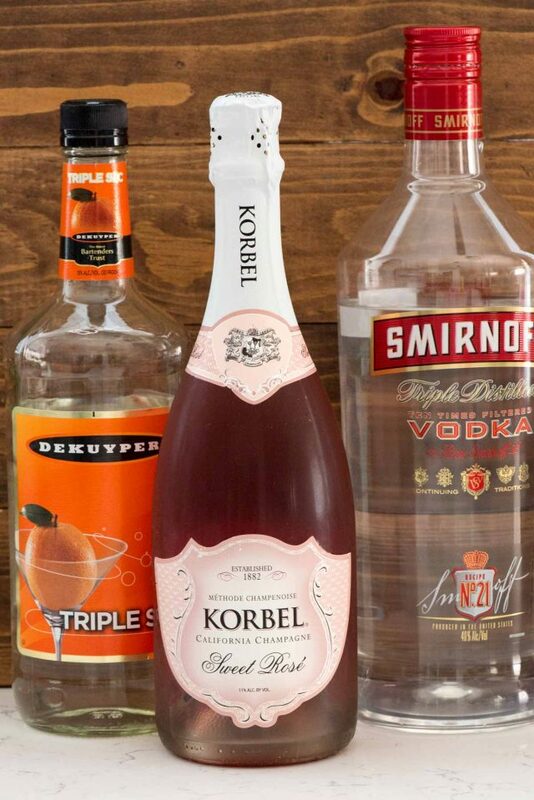 If you like sweet cocktails, choose the Korbel Sweet Rosé. If you prefer a less sweet alternative, use a drier rosé, such as Ruffino Sparkling Rosé. Orange infused vodka would be amazing in this as well. Pink Champagne Punch Cocktail is the perfect drink recipe for any occasion. Just three ingredients and it's pretty enough for a birthday, Christmas, or New Years Eve! Mix all ingredients in a pitcher. Garnish with orange slices and raspberries. To make one cocktail: mix 6 ounces champagne with 1 ounce vodka and 1/2 ounce triple sec, garnish as desired. This is perfect, it has my name written ALL over it, and I kind of feel like I am the reason you have leftover booze because I wasn’t drinking that much that weekend…until the last night with the bartender, then all bets were off 🙂 Seriously some of the best memories of the year! I want to use this for an upcoming party & was just wondering how long do you think this will keep its bubbly affect if I make a large quantity. I’m claiming this as my signature holiday drink! Seriously, this recipe couldn’t come at a better time because I’m hosting a boozey brunch for my girlfriend this weekend, and I don’t really care for mimosas. I love citrus but maybe the OJ is too strong in the drink, I don’t know. However, I love triple sec so I’m betting I will adore this recipe! I can’t wait to try it! Thank you for the perfect recipes!